June 2008 Colorado Springs, Co.
Am. 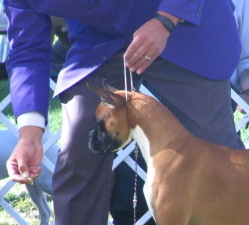 CH R And G's Arizona Wildcat "Reba"
Am. Can. BISS CH Berlane's Joint Venture "Dylan"
I want to thank Gayann Jones for allowing me to Co-Own this wonderful girl. In addition, for allowing me the link to their webpages and information contained in them.